As I walk the picket lines with the writers, the number one question I ask is: "what type of new media do you consume?". 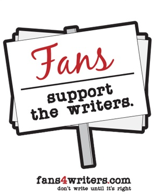 After a bunch of stammering, the number one answer from you striking writers -- our survey says -- "YouTube". As if YouTube is the end all and be all of new media. As if. So, class is now in session for alternate media channels on the Internet. Today we're going to learn about Joost. Joost is a system for distributing TV shows and other forms of video over the Web using peer-to-peer TV technology, created by Niklas Zennström and Janus Friis (founders of Skype and Kazaa). It boasts over 15,000+ TV shows and 250+ channels. You remember the term "peer-to-peer" or "p2p"? Yeah, that was the same technology that put Napster in the news a few years ago. "What's Joost? It's free TV, with the choice to watch alone or with friends. 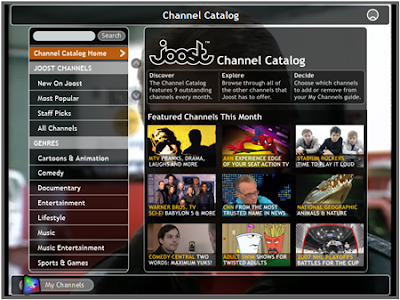 Joost is packed with internet tools such as instant messaging and channel chat, allowing people to really share the TV experience. It's a completely secure platform for content owners that respects their rights, while protecting and enhancing their brands. And it's an incredibly flexible way for advertisers to reach a truly global audience, in ways that really work. Joost isn't just video on the internet – it's the next generation of television for viewers, content owners and advertisers everywhere." Joost is free, supported by highly targeted ads based on people's actual watching habits, their friends' viewing patterns, and information they volunteer. Ad revenue is split between Joost and the content owners. Kinda like network TV was like back in the days of "I Love Lucy". Your homework tonight: sign-up for Joost, choose your Joost name and create a channel. Play around with the platform. Be sure to socially network and make friends.